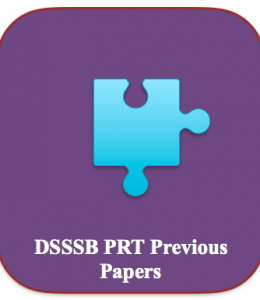 DSSSB PRT Previous Years Question Paper Download Fully Solved Model Sample MCQ Questions Answer Set Primary Teacher Recruitment written exam: Delhi Subordinate Services Selection Commission recruits Primary Teacher (MCD) and Assistant teacher (primary) and Nursery through different post codes. This year recruitment notification was published on the official website of www.delhi.gov.in through notification advertisement no 02/2017. There will be 2 sections in the written exam i.e Section – A consisting of General Awareness, General Intelligence & Reasoning ability, Arithmetical & Numerical Ability, Test of Hindi Language & Comprehension, Test of English Language & Comprehension and Section- B consisting of MCQs from teaching methodology/B.El.Ed./D.Ed./NTT/JBT etc. The recruitment test is one tier exam. Only tier 1 test will be conducted for the recruitment of DSSSB PRT MCD post recruitment (assistant teacher in Primary School). 100 marks written test will be conducted for the recruitment of DSSSB PRT in 2018. DSSSB PRT Model Question Paper Set Download Full PDF – CLICK HERE. Previous Years Question paper for Primary Teacher MCD (PRT) may be found on the link given here. Question Booklet series of earlier years / last 5 years or 10 years old paper may be downloaded in PDF format once the official website uploads the same. Candidates should use the fully solved question paper of DSSSB PRT test old exam papers as practice set and should also practice subject wise Multiple Choice Questions (objective type) for better preparation. DSSSB Primary Teacher Admit Card 2017-2018 Exam Date. You can download here previous years question paper of Special Education Teacher conducted by Delhi Subordinate Services Selection Commission. 2013 SPECIAL EDUCATION TEACHER POST CODE 001/13 – Click here. 2014 SPECIAL EDUCATOR – Written Test Conducted on 19-10-2014 – Click here. For the preparation of this test, all the materials will be available at the following link on our website Click Here. Written test paper may ask questions in Hindi and English both. In case of any query, please let us know through comment section below. Also visit www.jobsandhan.com for more updates and latest information regarding various Govt jobs in 2018-2019. Hindi me paper nhin aata h kya dsssb part ka kya ye paper keval English language me hota ?